After getting PA Server Monitor configured, you probably don't want anyone making unauthorized changes. There are a few ways PA Server Monitor can help. In the global Settings dialog there is a button labeled Console Security. Using that feature you can assign a password that must be entered everytime the PA Server Monitor Console is started. To clear an existing password, simply get into the Console again and enter an empty password. This is useful for locking down access to the local Console installed on the Central Monitoring System. For users logging in with a Console from any where other than the Central Monitoring Service, they will login using a username configured in Remote User Access. Use the "Run Reports" and "View Reports" rights rather than granting everyone "Administrator" rights. Every time PA Server Monitor starts, and about once a day after that, the entire configuration (except saved credentials) is backed up and saved. By default the back ups are stored in C:\Program Files (x86)\PA Server Monitor\Config\Backup. 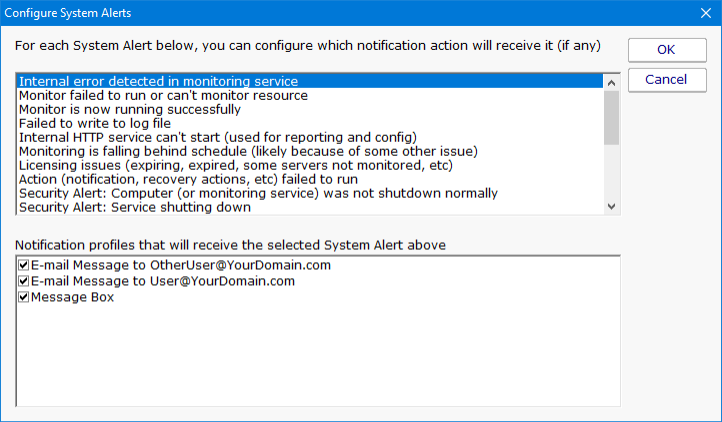 The Settings dialog also has a System Alerts button which will display the dialog below. Besides the security related events, there are additional events related to system stability, monitoring integrity and licensing. To control the means of notification for the different events, simply choose an event, and then check the appropriate notification means for that event.